The Top 7 Things that Sellers Can Do to Boost Curb Appeal. The majority of buyers will see a home online prior to a showing. First impressions actually begin online. All curb appeal improvements (see the following sections) need to be completed prior to photographs. Make sure that toys, garbage cans, and lawn equipment is put away prior to photography. I just sold this Condo at 20 Hall Avenue, Unit 2, Somerville, MA Davis Square. 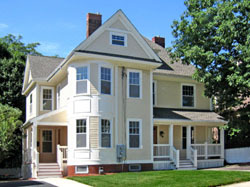 How is the Fall 2012 Market in Cambridge & Somerville, MA? One question that we always get is "How is the real estate market?" The answer is... "it depends on whether you are selling, buying, renting, investing, or developing." In this issue we discuss the fall real estate market in Cambridge and Somerville from these perspectives.